Even the most difficult tasks can be made easier with a plan. 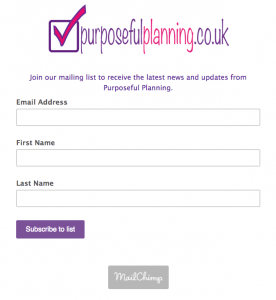 So let Purposeful Planning help guide you to a successful result! 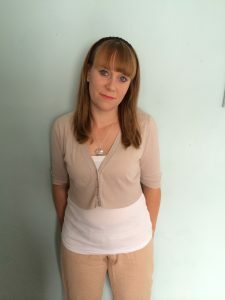 So a little about me my name is Sarah, I already run a business called the Christmas Elf Service and have decided to start another venture in the form of planning books and diaries. We are based in the lovely seaside town Eastbourne, East Sussex. 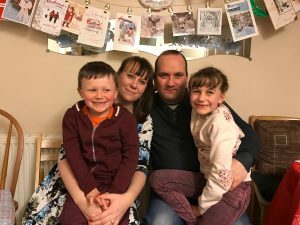 I live with my gorgeous husband Darren and my two children, one boy and one girl. I am obsessed with planning everything down to a tee! Without my plans sometimes I wonder how would I succeed in trying to achieve my goals. And so this is how I came to the idea of Purposeful Planning. Planning with a purpose! So as our new business grows we will be introducing lots of different planners and diaries. To start us off we are going to start selling a Diet Diary as many of us in January and the beginning of the new year need support in kick starting our need to become more healthy after all that chocolate and turkey! Start your 2017 diet now and make 2017 great! 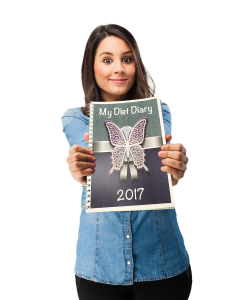 Our Diet Diary can help make the journey of slimming as easy possible and help guide you to a successful result. Even the most difficult tasks can be made easier with a plan, so let Purposeful Planning help you get to your desired weight quicker than going it alone. Our Diet Diary Food Log Journal Book has the choice of 6 different covers and lasts for 12 months, 52 weeks. Our Food Journals have a frosted plastic front cover and thick white card back therefore adding protection and durability. Finished off with a white binding wire. The Diet Diaries are packed into cellophane wrappers and then placed inside a padded envelope ready for delivery. They are posted out 1st Class Signed For. After we have done our Food Diet Diary, I will be producing another type of diary or planner and our company will start to grow more and more over time. We are always looking for suggestions for new planners and diaries so if you have any ideas please Contact Us we would love to hear them. We believe in providing our customers with good quality items with value for money and we hope we achieve this. Thank you to all those who help our small business grow through sharing, liking and buying our products.